The Wilmington High School boys bowling team, champions of the SBAAC American Division, from left to right, front row, Jake Frazier, Brayden Rhoads, Jordan Tackett, Conner Mitchell; back row, coach Ryan Hottinger, Grant Mayer, Grant Pickard, Mason McIntosh, Elijah Martini, coach Josh Fisher, coach Joe Gigandet. WILMINGTON – The Wilmington High School boys bowling team didn’t win the SBAAC American Division tournament Saturday at Royal Z Lanes. But Josh Fisher’s Hurricane did what they had to do to claim the overall SBAAC American Division championship. Wilmington was runnerup to Clinton-Massie last season. The Hurricane finished second in the tournament, one spot ahead of Western Brown. While the order of finish in the league is not official until all matches are complete, Wilmington is three games ahead of Western Brown, who has just one match remaining. Clinton-Massie was sixth in the tournament but had the third best bowler on the day. Adin Lamb had a 646 series with a high game of 234. The league championship is the fourth in the history of the WHS boys bowling program, but the first since the 2010 season. Elijah Martin had a strong day for the Hurricane, finishing fourth overall in the tournament with a 619 series. “Elijah had a good day,” Fisher said. Fisher said Grant Mayer came off the bench for the Hurricane in the third game and threw four strikes in a row, a pivotal portion of the match that kept Western Brown from possibly overtaking WHS. “We had five opens to start the game in that spot,” Fisher said of Mayer’s bounce-back performance. 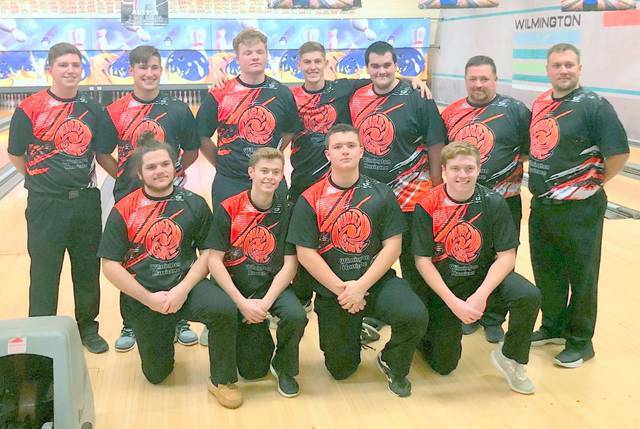 https://www.wnewsj.com/wp-content/uploads/sites/22/2019/02/web1_BWL_wilm_boyschamps.jpgThe Wilmington High School boys bowling team, champions of the SBAAC American Division, from left to right, front row, Jake Frazier, Brayden Rhoads, Jordan Tackett, Conner Mitchell; back row, coach Ryan Hottinger, Grant Mayer, Grant Pickard, Mason McIntosh, Elijah Martini, coach Josh Fisher, coach Joe Gigandet.